Perfect as a Christmas meal centrepiece, this pie has a layer of orange-fleshed pumpkin running down the middle, which is sandwiched between a toasted cashew and sage stuffing and wrapped in puff pastry. 1. Preheat the oven to 200°C/400°F/Gas 6. Toss the pumpkin in half the olive oil, then spread out in a large roasting pan and season with salt and pepper. Roast for 25 minutes until tender but not coloured. Transfer to a bowl and mash with the back of a fork to a chunky purée. Stir in the chilli, if using, then leave to cool. 2. Meanwhile, put the cashews in a separate roasting pan and toast in the bottom of the oven for 8 minutes, or until starting to colour. 3. While the pumpkin and cashews are cooking, heat the remaining oil in a large frying pan over a medium heat. Add the onion and cook for 7 minutes until softened, stirring often. Add the garlic and cook for another minute. 4. Transfer the onion mixture to a bowl and stir in the herbs, breadcrumbs, chestnuts, one of the beaten eggs and the yeast extract. Finely chop the cashews, then add to the bowl and stir well until combined. Season generously with pepper. 5. Lightly dust a work surface with flour and roll out the pastry on a piece of baking paper to a 34 x 30cm/13½ x 12in rectangle. Spoon half of the cashew mixture down the middle of the shortest length of the pastry, in a strip about 12cm/4½in wide, leaving a gap either side and at each end of the pastry. Spoon the pumpkin mixture on top in an even layer, then follow with the remaining cashew mixture. Brush the edges of the pastry with a little of the remaining egg and fold them over the filling to meet in the middle. Trim any excess pastry and press the edges together to seal. Make diagonal slashes in the top of the pastry and fold in the ends to seal in the filling. 6. Carefully, lift the wellington using the paper to a non-stick roasting pan, and brush the top with the remaining beaten egg. Cut down any excess baking paper and bake for 35-40 minutes until the pastry is golden. 7. Meanwhile, make the parsnip crisps. Toss the parsnips in the oil, season with salt and pepper, then put in a roasting pan. Roast at the same time as the wellington for 15-20 minutes until crisp and light golden. 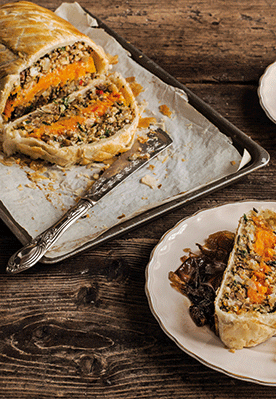 Serve the wellington cut into thick slices, topped with the parsnip crisps. Extracted from The Part Time Vegetarian by Nicola Graimes © Nicola Graimes 2015 published by Nourish Books, London, Hardback £20. Commissioned photography by Haarala Hamilton.